When I first wrote this guide, there weren’t a whole lot of other “best Micro 4/3 lens guides” out there. There was a link to the first lenses you should buy, followed by an ode to the Voigtlander Holy Trinity and a couple thorough guides to get you on your way. But now there is a plethora. Plus, there are a bazillion more lenses to choose from. It’s much more difficult to recommend a set of “best Micro 4/3” lenses now than it was in 2015. Every single focal length has received updates or a set of lens competitors, bringing prior recommendations into question. Two lenses still stand as the best choices in their respective focal lengths (in my opinion), but are now joined by equally great alternatives that may be superior for a specific photographer’s needs. This list isn’t meant for brand new photographers or for someone looking to save a few bucks. It also hasn’t been written with any type of photographer in mind. It’s a fairly opinionated guide and is too expensive for many to outright afford. But these lenses bring the strengths of the Micro 4/3 format to the forefront and are worthy pieces of glass to own for any circumstance. The wide end of the Micro 4/3 format was, for the longest time, covered by the worthy Olympus M. Zuiko ED 7-14mm f/2.8 PRO. It was a brand new lens at the time and used to cost an arm and a leg to own. Now, it’s less expensive and its strengths and weaknesses are better understood. Those weaknesses are largely improved upon by the new Panasonic Leica DG Vario-Elmarit 8-18mm f/2.8-4 ASPH. This new Pana Leica option covers nearly the same focal lengths as the Olympus 7-14mm PRO, shedding 1mm on the wide end and gaining 8mm on the long end. 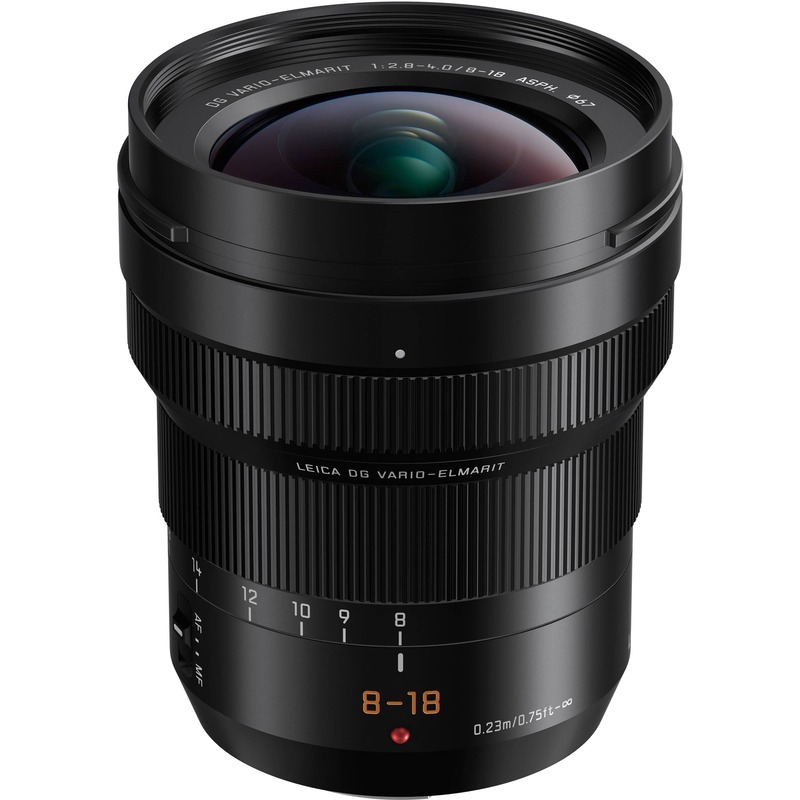 More importantly, the Panasonic Leica DG Vario-Elmarit 8-18mm f/2.8-4 ASPH sheds the bulbous, moveable front element of the Olympus 7-14mm f/2.8 PRO in favour of a stationary front element. This provides the ability to use individual lens filters and entire filter systems (without a special adapter)—like those most often used when shooting wide angle landscapes. For landscape photographers, the ability to utilize lens filters is compulsory, and the Panasonic Leica DG Vario-Elmarit 8-18mm f/2.8-4 ASPH delivers. Plus, Panasonic Leica DG Vario-Elmarit 8-18mm f/2.8-4 ASPH comes in at a reasonable $1,100 — equally priced with the Olympus 7-14mm f/2.8 PRO. The 17mm (34-35mm full-frame equivalent) focal length was the poorest served of all focal lengths in the Micro 4/3 system when I first wrote this guide in 2015. There were 2 or 3 options, each of which had major compromises. 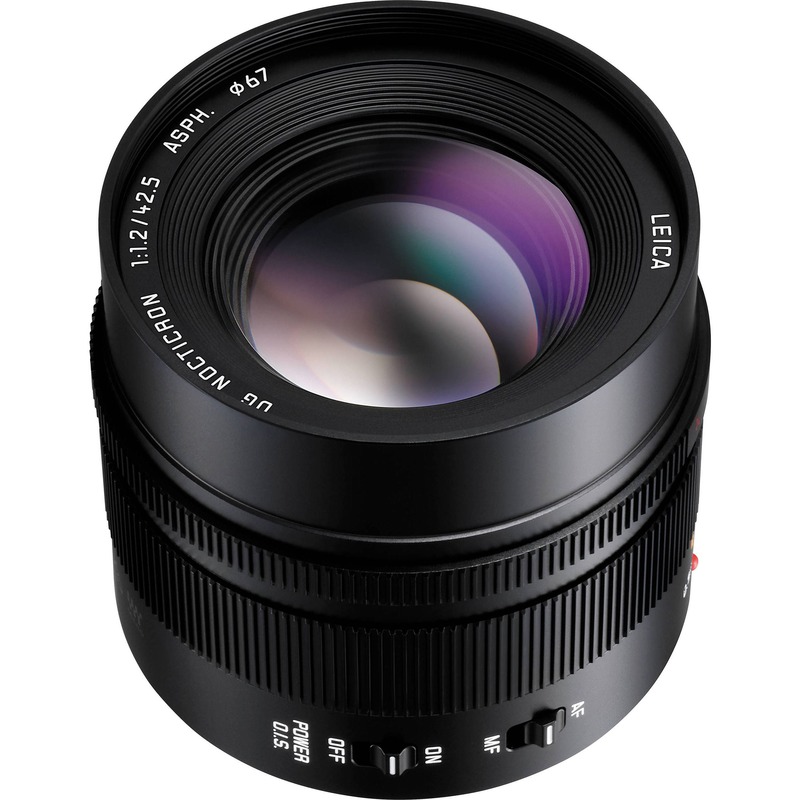 The Voigtlander Nokton 17.5mm f/0.95 came away as the 17mm lens of choice due to its character and build quality. After a few years, more competition has been introduced. Although a bit wider than its competitors, the Panasonic Leica DG Summilux 15mm f/1.7 is a fantastic option, but isn’t sealed and isn’t that coveted 17mm focal length. Instead, Olympus’ latest PRO prime lens comes away as the best option in this focal length. The new Olympus 17mm f/1.2 PRO comes with all the wonderful features of the PRO line, like customizable function buttons, a manual focus clutch, a hard-stop manual focus ring, and unprecedented build quality. Plus, the new 17mm f/1.2 PRO has a large, fast aperture great for capturing events in low light. 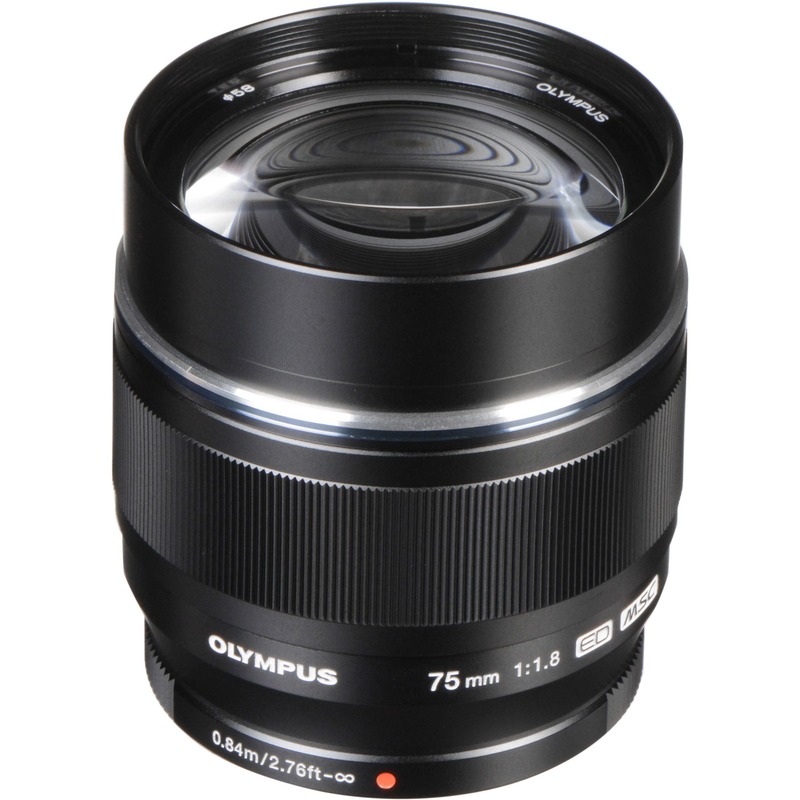 The 17mm f/1.2 PRO brings Olympus’ renowned lens technology to the most coveted street focal length. As a friend of mine has pointed out, the 17mm f/1.2 PRO is part of a greater PRO prime lens lineup, ensuring compatibility other lens manufacturers can’t match. The Olympus 17mm f/1.2 PRO, 25mm f/1.2 PRO, and 45mm f/1.2 PRO all have about the same body size, the same size front element, and equivalent lens features, ensuring an easy transition from one focal length to the next and allowing for a transfer of your lens accessories. 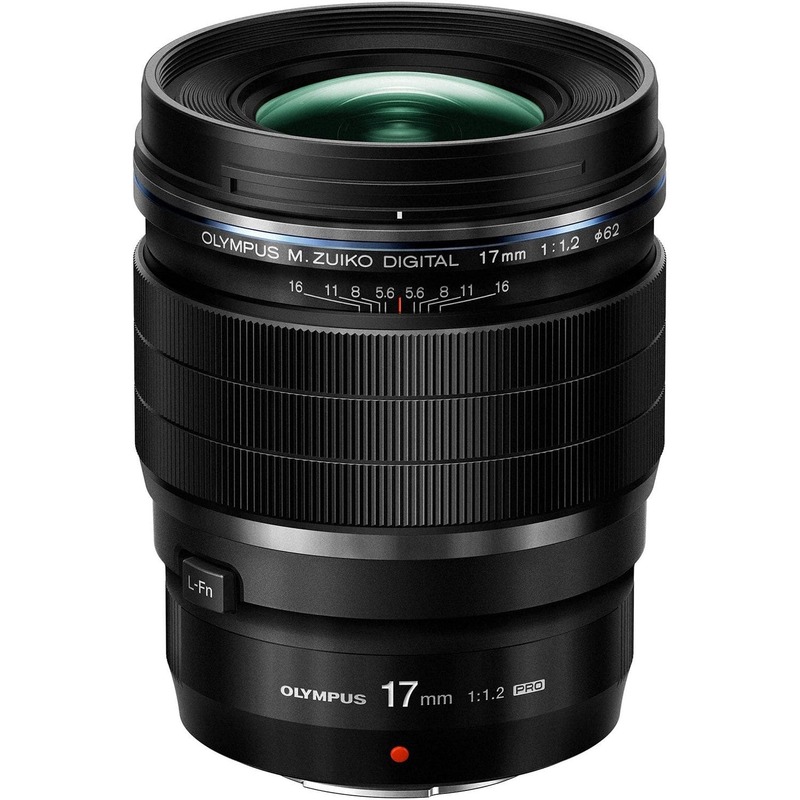 Best of all, the Olympus 17mm f/1.2 PRO comes in at right around the same price as the prior Voigtlander Nokton 17.5mm. At $1,200, this lens isn’t cheap, but it’s the best 17mm you can buy and isn’t much more than its competition. The second sister in the Olympus PRO prime lineup is the Olympus 25mm f/1.2 PRO, and it’s a beauty. This lens feels like a gem in the hand, with tremendous build quality, fast autofocus, Olympus’ impeccable lens features, and an ideal weight for using with Olympus’ OM-D E-M1 Mark II camera. 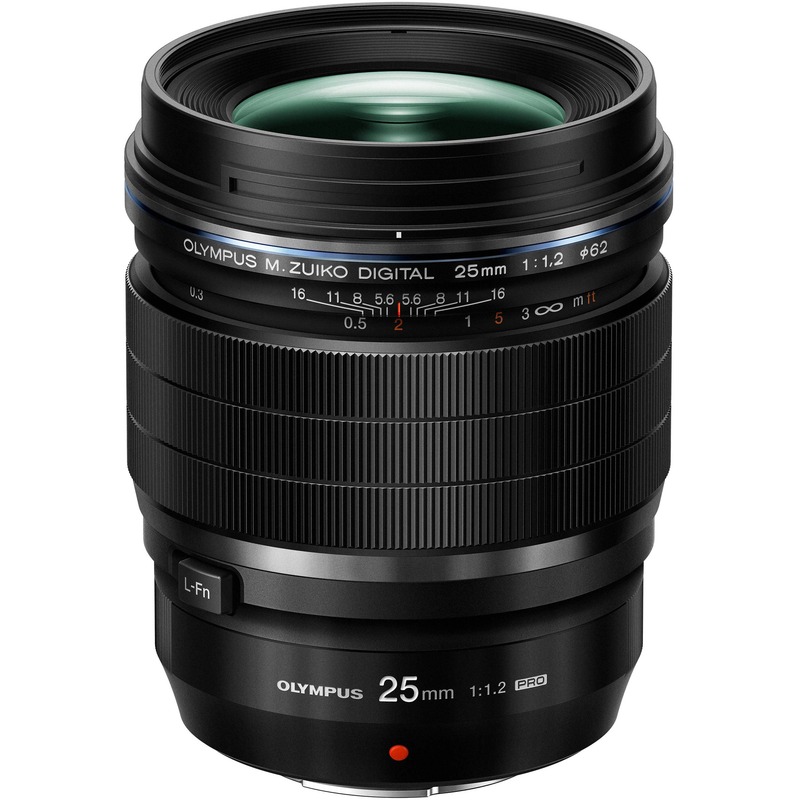 As mentioned above, the 25mm f/1.2 PRO mimics the same build features of the other PRO prime lenses offered by Olympus. Build quality, size, front element size, and lens features are all equivalent between the 3 lenses, making them the ideal prime lens family to own. The 25mm f/1.2 PRO dethrones the venerable Panasonic Leica DG Summilux 25mm f/1.4 from 2015 and earlier. The Summilux 25mm f/1.4 still offers a character nearly unmatched by any other lens available for Micro 4/3 cameras, but it does so with a poorer build quality, slow autofocus, loud operation, and a range of other compromises. That said, the Panasonic Leica DG Summilux 25mm f/1.4 is still significantly less expensive than the Olympus 25mm f/1.2 PRO offering. If you’re looking to spend the big bucks to get the best 25mm lens available, the Olympus 25mm f/1.2 PRO at $1,200 is for you. However, the Panasonic Leica 25mm f/1.4 at around $500 is still a great competitor. Although Olympus has launched an incredibly well built 45mm f/1.2 PRO lens, it had the biggest shoes to fill of any single lens in this guide. And although it gives the Nocticron a run for its money, dethroning the Nocticron hasn’t happened today. The Nocticron is legendary in the Micro 4/3 world and is one of the few lenses capable of luring photographers into the Micro 4/3 system on its own. This lens is known world-wide not only as the best Micro 4/3 lens, but as one of the best lenses ever produced in the industry. After looking at the perfect bokeh, or the lens’ sharpness at a wide open f/1.2, it’s easy to see why the Nocticron is a heralded lens. The Panasonic Leica Nocticron f/1.2 is modelled after the even more impressive Leica Noctilux and, as such, features a top notch build quality, large front element, and super fast aperture. The lens is a bit bigger and heavier than the generic Micro 4/3 lens because of the included Optical Image Stabilization, but the image quality and colour rendering more than make up for the size. The lens renders colours in a warmer, softer fashion than any other lens in the Micro 4/3 system and its bokeh is out of this world. Many argue the Nocticron’s image quality isn’t worth the hefty price tag premium. The Nocticron runs a cool $1400 USD brand new and can occasionally be found on eBay in the $800 to $900 USD range. Brand new, it’s one of the most expensive Micro 4/3 lenses you can buy. And when you consider some photographs shot with the Olympus 45mm f/1.8 lens, or the Voigtlander Nokton 42.5mm lens, or even the less expensive Panasonic Lumix 42.5mm, it’s hard to imagine the Nocticron being truly worth such a price tag. $1400 USD is right up there with full frame lens pricing, so justification for the Nocticron is fundamental. However, I’d argue many people choose to shoot Micro 4/3 not because of the cost, but because of the size, portability, and other features of the system as a whole. With that in mind, $1400 for the best image quality the system offers isn’t as bad a deal as it’s made out to be. I owned the Nocticron for a period earlier in my photography career, and to this day, it still reigns as my favourite lens ever. There is a certain magic inside the Nocticron and it reigns as the best portrait lens money can buy for the Micro 4/3 system. Another carry-over from the prior 2015 guide, the Olympus M. Zuiko ED 75mm f/1.8 remains one of the most unique lenses in the system. As a portrait lens, the 75mm f/1.8’s 150mm full-frame equivalent focal length is a long one, but this lens renders some of the most beautiful, most sharp images found in the system. The 75mm is built of metal and glass and is heavy in the hand. Despite its heft, the lens isn’t overly large and fits on any OM-D camera comfortably. Colours are a bit sterile and neutral, but that’s more an Olympus trait than it is a 75mm trait. Considering the focal length (and the cost) of this lens, I’m surprised it’s not weather sealed. It’s not a comfortable lens to use indoors because of the 150mm focal length, so it begs to be taken outside and shot in Mother Nature. There aren’t many competitors for the Olympus 75mm, and that’s probably for good reason. The 75mm offers some jaw-dropping bokeh and tack sharp images wide open. With it’s relatively small size, I find it hard to believe Panasonic or Voigtlander could come up with a more capable lens. The lack of weather-sealing is why I decided to sell this lens. I remember thinking the professional level Olympus 40-150mm f/2.8 PRO lens would fill the long portraiture range nicely. And although that certainly is the case, there is no matching the 75mm’s size, speed, sharpness, and autofocus speed. The Olympus 75mm f/1.8 runs a $750 USD price tag and is one of the less expensive lenses on this list. Without a doubt, that price tag is worth every dollar. A brand new addition to this guide and a brand new focal length range, the Olympus 40-150mm f/2.8 PRO is the best standard telephoto zoom you can buy for Micro 4/3. I’ve mentioned it a few times already, but the Olympus PRO lens lineup has a set of standard lens features, like a manual focus clutch, manual focus hard stops, lens function buttons, and an impeccable build quality, all of which hit the 40-150mm f/2.8 PRO in full force. The 40-150mm f/2.8 PRO is a beast. It’s one of the largest lenses you can buy for a Micro 4/3 camera and it’ll feel unwieldy on smaller Micro 4/3 bodies. In fact, I left the 40-150mm f/2.8 PRO off the original Micro 4/3 lens guide because of its hefty size. However, on larger bodies like the OM-D E-M1 Mark II (and, potentially, with the corresponding E-M1 Mark II battery grip), the 40-150mm f/2.8 PRO feels fantastic. The 40-150mm f/2.8 PRO also focuses quickly and precisely, nailing focus on action shots or longer-range portraiture. This focal range is widely used in wedding scenarios and is a worthy addition to any wedding photographer’s kit. 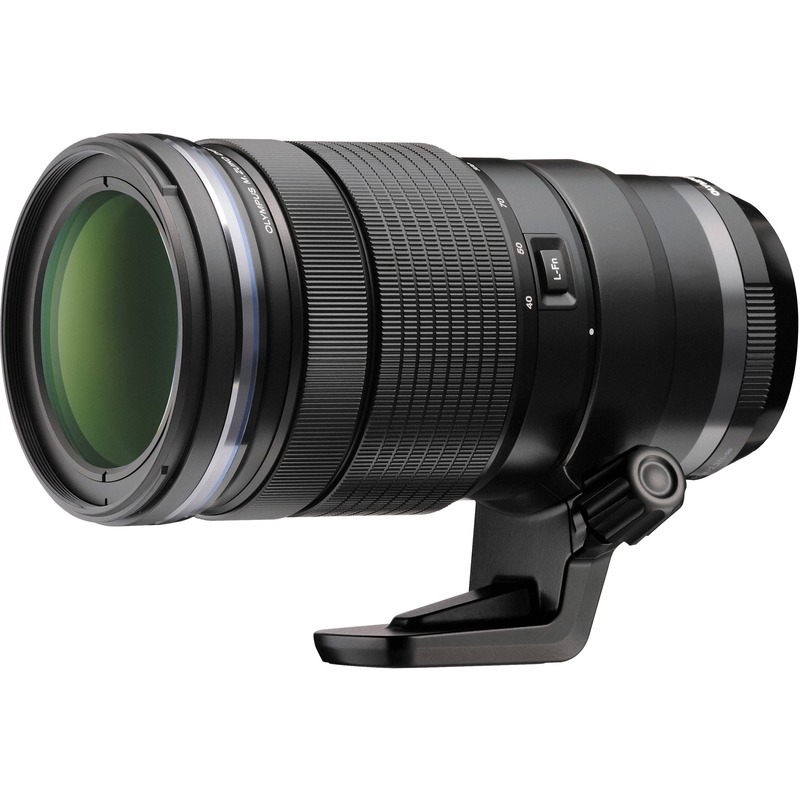 It also combines with the Olympus 1.4x Tele-Converter to provide more reach for sports, wedding photography, or even some wildlife photography. The Olympus 40-150mm f/2.8 PRO debuted as one of the most expensive PRO lenses available, but has since seen some price cuts. The lens now comes in at $1,300. This, plus the 1.4x Tele-Converter, make for a worthy combination that will fill most telephoto needs for most Micro 4/3 shooters. I want to add this special mention to the guide, as the new Olympus 12-100mm f/4 PRO lens is one of the few one-size-fits-all lenses available for any camera system that is worthy of a recommendation. Usually travel zooms are utter crap. I used to own a Nikon Nikkor 18-200mm f/3.5-5.6 for my very first DSLR camera and it was a constant battle of compromises. Slow autofocus, zoom creep, and a general lack of sharpness all hindered the performance of that first generation lens. I never liked it and sold it pretty quickly after buying it. But none of the same can be said of the Olympus 12-100mm f/4 PRO. This has to be the best travel lens in the Micro 4/3 system — maybe even the best for any camera system. Results are sharp from 12mm through to 100mm. The f/4 aperture doesn’t provide the greatest depth of field, but for travel purposes, it more than fits the bill. 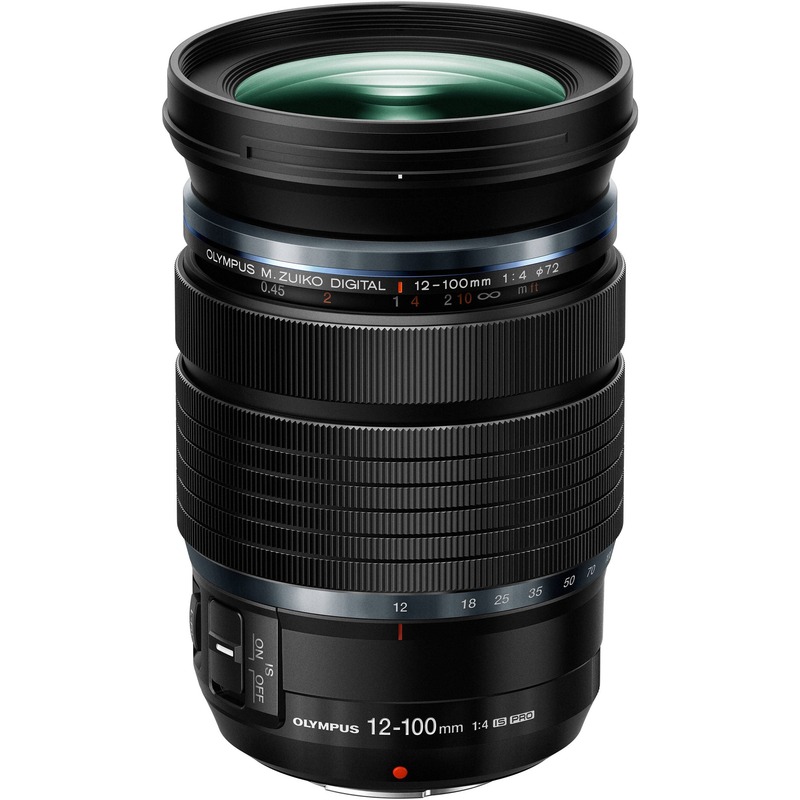 And, once again, like every other Olympus PRO lens, the 12-100mm f/4 PRO offers all the impeccable Olympus lens features. This lens is built sturdy and weather-proofed, perfect for travel to a foreign land full of dust, humidity, or both. Here’s the kicker: For many photographers, the 12-100mm f/4 PRO may be the only lens they ever need to buy. At $1,300, it’s not the cheapest single lens you could purchase. But with a high-end Micro 4/3 camera and the 12-100mm f/4 PRO, nearly every need can be met in a lens that is built like a rock and never has to leave your camera mount. There is great value in a one-size-fits-all lens, especially one built as great as Olympus’ 12-100mm f/4 PRO travel lens. There are a few notable lenses left off this list which may raise some eyebrows. Olympus 12-40mm f/2.8 PRO: In the 12-40mm f/2.8 PRO, Olympus created a small, weather-proofed, sharp lens to cover all natural focal lengths. This one lens could theoretically replace 3 of the lenses on this list. However, at f/2.8, the Olympus lens just isn’t fast enough. And further, Olympus’ sterile, neutral colour rendering isn’t as pleasing (in my opinion) as the rendering of the Panasonic Leica options. I believe you will be happier with any (or all) of the regular focal length prime lenses above than you will be with the single Olympus 12-40mm f/2.8 PRO. However, if you’re going for a minimal kit that doesn’t require any lens switches, then the Olympus 12-40mm f/2.8 PRO is a worthy regular zoom lens. Olympus 300mm f/4 PRO and the Panasonic Leica DG Vario-Elmar 100-400mm f/4-6.3: Both lenses super-telephoto lenses are fairly expensive and fit the bill for a very specific set of photography (sporting events and wildlife photography come to mind). Shooting a super-telephoto prime is very difficult as well, as the distance and focus is very hard to nail. These lenses are worthy additions to any kit, but I don’t think they should be a priority for the average Micro 4/3 shooter before any of the other lenses above. If you have a specific set of needs though, by all means. Hopefully the lens selections above meet the criteria you’re looking for. Again, price is no factor here — these are the greatest lenses you can buy in the Micro 4/3 system, bar none. After this, I’d purchase based on my immediate needs. Travel? The Panasonic Leica DG Vario-Elmarit 8-18mm f/2.8-4 ASPH or the Olympus 12-100mm f/4 PRO would be on my purchase list next. Want to shoot sports or get into portraiture? Any of the Olympus M. Zuiko ED 75mm f/1.8, Olympus 40-150mm f/2.8 PRO, or even one of the super-telephoto options would be next on my list. But as always, it’s not about the kit. The kit is only good for enabling you to capture the moment in as artistic a way as possible. Ignore the gear geekery if you’re just looking for inspiration — inspiration is better found in other areas.